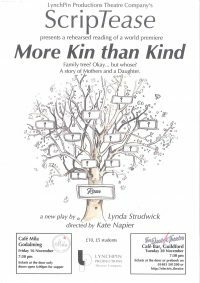 LynchPin Productions Theatre Company’s ScripTease presents a rehearsed reading of a world premiere More Kin than Kind; a new play by Lynda Strudwick and directed by Kate Napier. A story of Mothers and a Daughter….Family Tree? Okay….but whose? Tickets cost £10 (£5 for students) tickets at the door only.